SAN JOSÉ, Costa Rica – A large hummingbird mural shimmering with aqua blue and lime green hues welcomes visitors to Chietón Morén, a two-room museum and shop devoted to indigenous cultures. Once inside, the only sound hinting at the busy San José street outside is the beeping of car horns. Andrea Morales is there four days a week to greet visitors, balancing her half-time job and volunteer work at Chietón Morén with her studies at the University of Costa Rica. Andrea Morales explains the mission of Chietón Morén to visitors. 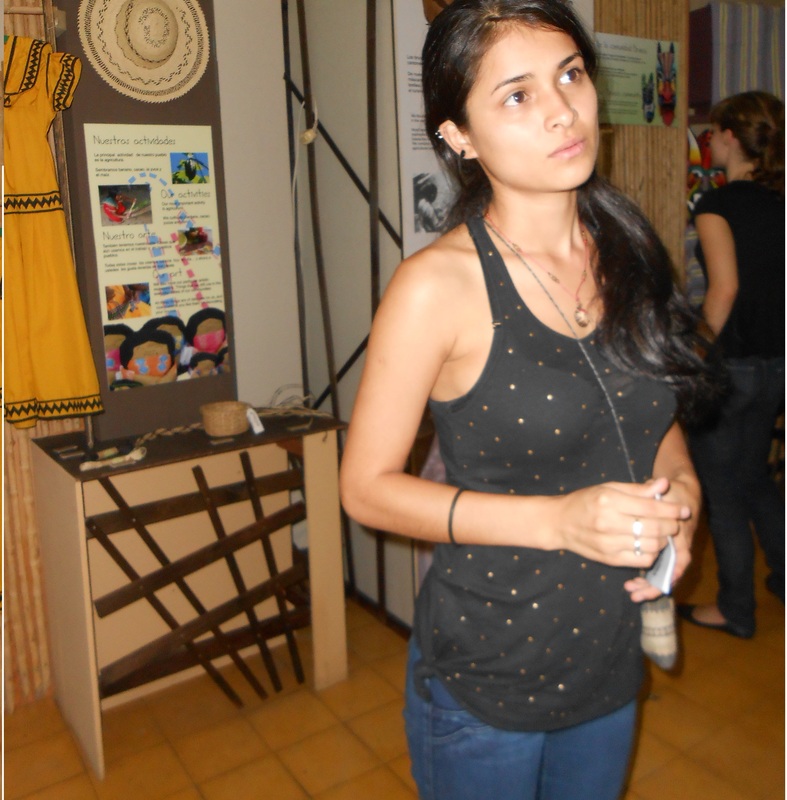 The museum is designed to educate visitors about Costa Rica’s indigenous people and their history, Morales explains. She herself is a member of the Boruca (also known as Brunca) tribe and wears a handmade shell necklace from her region. Chietón Morén means fair trade in the Boruca language, a name the nonprofit organization’s founders chose to reflect their philosophy about the place where indigenous people can showcase and sell their items to make them more accessible to the public and to get a fair price for the goods. “Chietón Morén allows you to learn a lot about indigenous cultures and that alone is very important and why we exist,” Morales said. The concept for Chietón Morén was the brainchild of Pilar Ureña, Jan Westra and Junto Marina Lazaro (a member of the Boruca people) and came to fruition in July 2010. Westra envisioned a place where people could come to learn and support a large portion of the neglected and marginalized communities in Costa Rica. The one-room museum also serves as an interactive classroom. Tall upright posters highlighting specific crafts, rituals and traditions unique to each tribe line the walls. The stand-alone map in the middle educates visitors about the locations of each of the eight indigenous groups: Brunca, Bribri, Cabécar, Chorotega, Guayamí (Ngobe), Huetar, Maleku and Teribe. 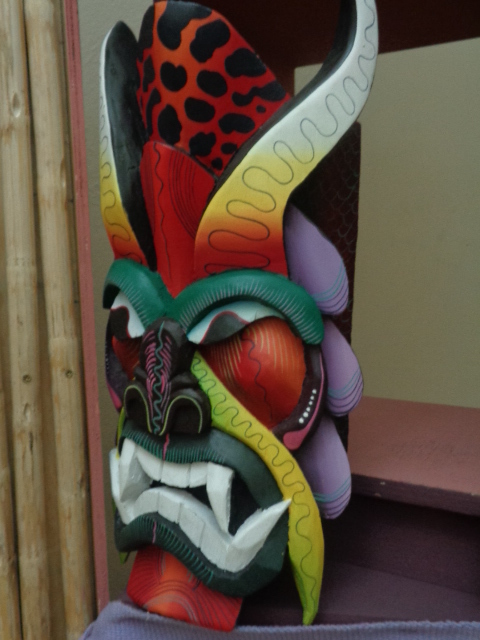 A Brunca mask is one of many in the shop. On the opposite side of the breezeway beaded curtains lead to a room bursting with color and handmade items: carved gourds, beaded earrings, brightly colored masks, and small turtles, elephants and anteaters made of bark. The store portion of Chietón Morén is restocked monthly. The craftspeople set their own prices, and the profit from all purchases goes directly back to the specific tribe where it originated. At the time of purchase, volunteers write the item in the inventory book under the corresponding tribe and “the money from the sale goes directly into that community’s bank account,” Morales said. Chietón Morén can operate this way because the building space was donated by La Dolorosa Catholic Parish, located directly behind the shop and museum. There is no rent to pay and most of the workers are volunteers. A very small percentage of the sale of each item goes to operating costs such as electricity, water, cleaning and bags for the merchandise. Earrings handmade by the Bribri tribe hang on display at Chietón Morén. Morales is the only part-time worker at Chietón Morén but also volunteers when she can because she worries an appreciation for her people will be lost and she likes to know that visitors appreciate her culture and indigenous way of life. “Without volunteers, who knows if this project could have gone forward,” Morales said. Chietón Morén’s fourth anniversary was celebrated in July with a special exhibit at the National Archives. “The most rewarding factor about Chietón Morén is that we get to give the indigenous people a chance to make money in an honest way without changing or interfering with their unique way of life,” Westra said. Two languages of the eight indigenous groups have died entirely, and Morales’ home tribe was one of them. She hopes that Chietón Morén will educate those unaware of this problem while helping and representing indigenous tribes for years to come. “I want people to know that indigenous people have to fight for their rights and that there is a deficiency in education that I wish did not exist,” she said. * Chietón Morén is located between Avenidas 10 and 12 on Calle 1 in San José and operates Monday through Friday, 10 a.m. to 4 p.m.